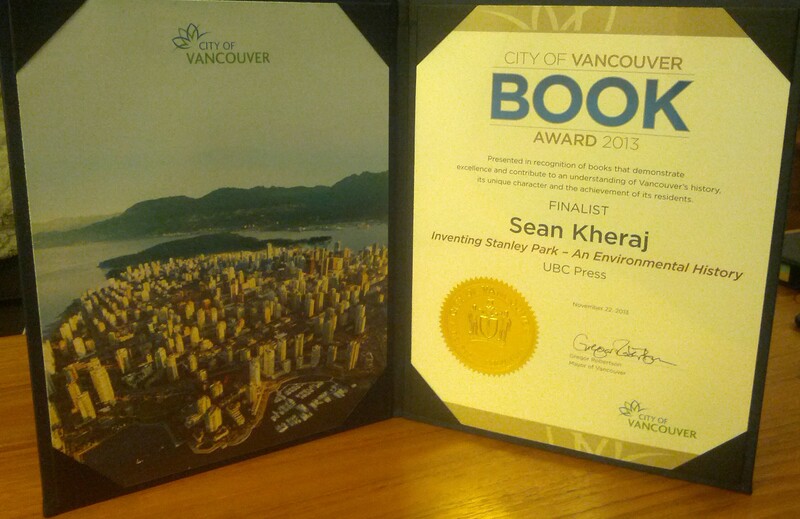 Last month, judges for the 2013 City of Vancouver Book Award selected Inventing Stanley Park: An Environmental History as one of five finalists for this annual prize. The award recognizes books of any genre that “contribute to the appreciation and understanding of Vancouver’s history, unique character, or the achievements of its residents.” Amber Dawn’s How Poetry Saved My Life: A Hustler’s Memoir won the top prize, awarded at the Mayor’s Arts Awards gala in late November. I wanted to thank the jury and the city staff who organized this year’s book award for this tremendous honour. As a former Vancouver resident now living in Toronto, it means a great deal to me. When I wrote Inventing Stanley Park, I hoped that it would appeal to a wider audience beyond the scholarly community. In addition to making a contribution to the study of environmental history, I wanted to make a deliberate contribution to the history of Vancouver and British Columbia. The editors and production team at UBC Press deserve much credit for helping to make the book more accessible and getting it into the hands of Vancouverites and admirers of the park. Post by City of Vancouver – Cultural Services.